Theo Arends continues to fix, improve and expand TASMOTA at a rate that, as a mere mortal, I find incredible. One of the areas which has seen a lot of activity is the list of supported modules and devices. When you connect to the web server on your device and select the configuration menu, the top item on the list is “Configure Module”. 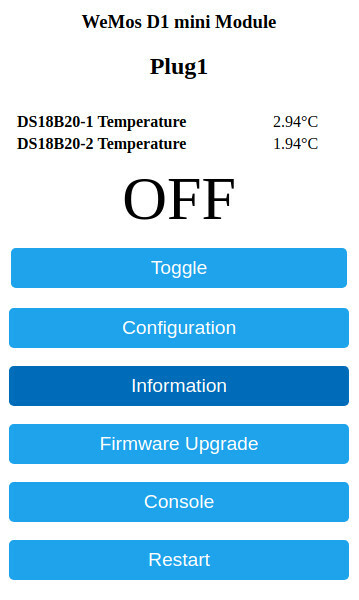 This allows you to select your specific hardware (currently, with release 5.11.1, ranging from the original ITead Sonoff Basic, all the way through to the Arilux LC06 RGB LED controller) to enable device-specific features in TASMOTA. While there are 40-odd entries in the module list, the question is, are you out of luck if your hardware isn’t yet included? The answer, I’m glad to report, is a resounding “Heck, no!”. Theo has included a couple of devices in the list which make it relatively easy to drop TASMOTA onto pretty much anything which has an ESP8266 device on-board and have it work,not only with the basic relay switching function, but also with a whole load of other, custom goodies connected. Here’s an example. I usually have a couple of the “Yellow Dev Boards” to hand, mainly because they’re so easy to press into service without having to jump through too many hoops. They have plenty of nice LEDs, an on-board, low quiescent current voltage regulator and an attached battery holder (making for an easy, remote sensor platform), an LDR already wired to the ADC input, all driven by an ESP12 variant (the version has varied over time). TASMOTA doesn’t have a configuration entry for the Yellow Dev Board specifically, but because the board has an ESP12, most of the entries on the list will work to some degree or other. 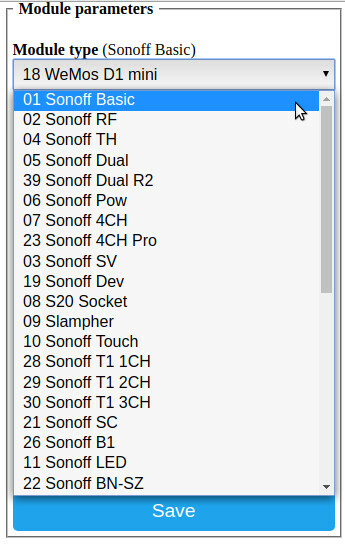 Okay, so why don’t we just go with the default “Sonoff Basic” then? Because the Basic only has a limited number of GPIOs available (and some of them are inverted via MOSFET drivers), it doesn’t lend itself too well to customization. You can load your own board with the Basic and successfully connect to the TASMOTA web server, but then you really need to look through the hardware available in the “Configure Modules” list and find something which is closer to your specific hardware. If you’re using a Witty Cloud board (rather than the Yellow), for instance, you’re in luck; entry #32 in the modules list is for that specific board. If you have a Wemos D1 Mini, that’s also included at number #18. It’s worth scanning the list to see whether your specific board might have been added recently. As you can see from the screenshots, the entries in the list aren’t sorted, so searching for an entry can be a little difficult. As it turns out, the WeMos D1 entry is a good choice when you’re using an ESP12 series ESP8266 and this is the one I’ve chosen in the screenshot examples (the grey entry at the very top). After selecting (and saving!) 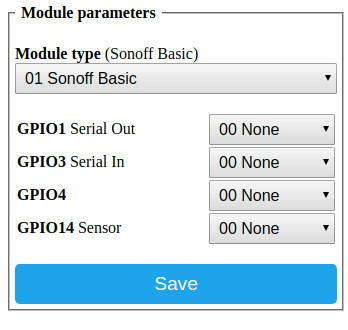 this module type, you’ll find that the GPIO options are greatly expanded, compared to the Sonoff Basic. 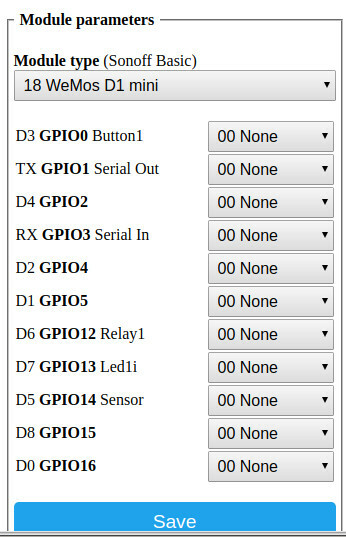 Note that the WeMos D1 parameter list includes the WeMos pin nomenclature to the left of the GPIO names and the Sonoff default assignations to the right. 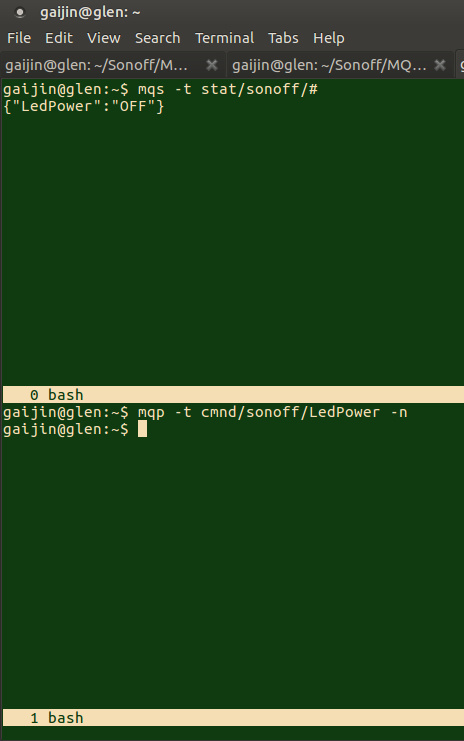 This looks a little confusing at first glance, but is actually quite useful when deciding where to connect peripheral devices on your own ESP module (for instance, assigning your relay/SSR to GPIO12 and LED to GPIO13 will still leave your device working if the module type is changed back to Sonoff Basic at any time in the future). The drop-down selection box to the right of each GPIO (currently showing “00 None”) allows you to select what function or peripheral you’d like to have assigned to that pin. 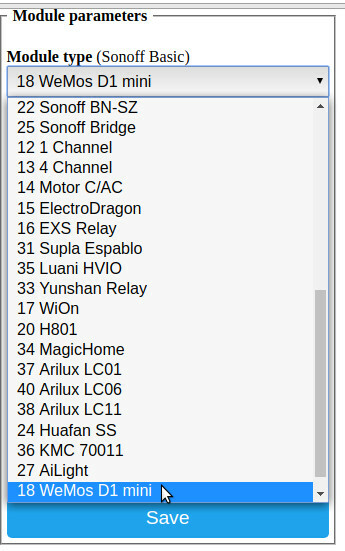 Again, choosing the WeMos D1 module type enables a wide range of options for each individual GPIO (as of version 5.11.1 of TASMOTA, there are 64 different switches, buttons, LEDs, sensors, busses, relays and functions available, including some which I assume are device specific — what’s a “PZEM Tx”?? — and others which look like a future project in the making — do “IRrecv” or “BkLight” sound interesting to anyone other than me?). So, going back to our Yellow Dev board, we have an RGB LED, as well as a bunch of boring old red LEDs across the top of the board (see the picture, above). In this particular application, we’re going to add a DS18B20 temperature sensor to GPIO5 and a small, solid-state relay (SSR) to GPIO12 (the default Sonoff relay pin). This is going to allow us to switch an incandescent light bulb on (as a low power heater) when the DS18B20 indicates that the temperature has dropped below freezing. As it’s no fun at all to do this sort of thing without blinkenlights, we’re also going to use the RGB LED to indicate freezing temperatures (blue flashes), above freezing (red flashes) and, for bonus points with those people who aren’t as colour-blind as I am, hovering around freezing point (purple flashes). We’re also going to add a button to GPIO0 which will provide the standard Sonoff/TASMOTA functions of toggle (for the relay/SSR), as well as the ESP8266 default of forcing the module into programming mode when pressed at power-on. We’re going to use two methods to drive the LEDs; simple on/off for the green LED (because it’s the Sonoff default power LED, as the handy cross-reference in the Module Type menu, above right, shows us) and PWM drive for the red LED (GPIO14) and blue LED (GPIO15). One point to note about the green LED is that the xref text shows it as “Led1i”. That trailing “i” indicates that, on the Sonoff, the ESP output is inverted, because the LED is actually driven via a dedicated MOSFET. On our Yellow board there’s no driver MOSFET, so we choose the non-inverting “Led1” when assigning a device to GPIO13. GPIO14 and GPIO15 are LEDs, but because we want to vary the intensity and mix the colours (it’s that chunky, though-hole RGB LED at the top right of the Yellow board, remember), we’re going to assign types PWM1 and PWM2 to them. The SSR is assigned type “Relay1” on the Sonoff default GPIO12 and we assign type “DS18B20” to GPIO5. The sensor assign does neat stuff, using Theo’s modified version the One Wire code to communicate on the designated pin (you must add a 4k7 resistor between the 3v3 pin and the data pin to have this work correctly and, if you’re using a sensor on long, unshielded leads, I’d recommend that you place the resistor at the outer, DS18B20 end, rather than on the GPIO end and add a 0.1µf between the DS18B20 ground and 3v3 pins). When you hit “Save”, the module will be restarted with your new configuration implemented. At this point it would be a good idea to go back into the main configuration menu and select “Backup Configuration” to save all of those changes to a file on your local machine. In the second part of this post, we’ll look at some minor hacking of the Yellow board hardware to make a functional device, as well as going over the web and MQTT commands to get the peripherals working. Sometimes, while browsing GitHub for ESP8266-related projects, I come across a user’s page which just happens to “push all the right (ESP8266) buttons” for me. One which I came across recently was from martin-ger and he has several projects which tickle my fancy. The first is an ESP8266 NAT-ing router, with simple firewall and traffic-shaping features built-in. This really is very, very nifty and is well worth checking out. The second is an extension of TuanPM’s MQTT library to add broker functionality. Yup, now your ESP8266 can act as the MQTT “server” as well as being a client. The latest updates include retained messages and last-will-and-testament functionality. 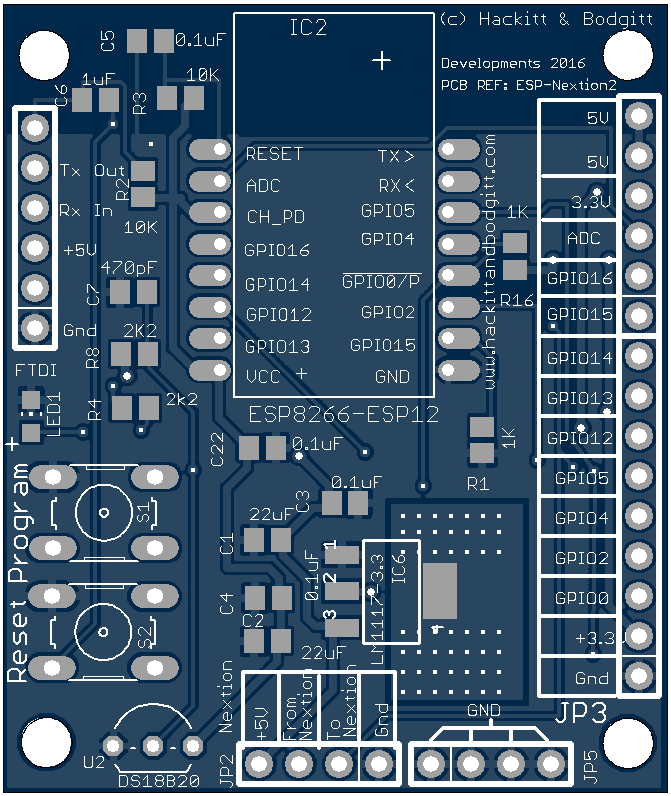 Also worth a look is Martin’s implementation of an ESP8266-based SLIP router. It may be slow, but it’s another very neat project. Those three should keep you amused over the weekend and give you a sample of what Martin is capable of. Definitely a page worth bookmarking! Regular visitors may remember a mention I made of an ESP8266/433Mhz gateway project a couple of weeks back. Well, one of the reasons I found it so interesting was that I have a (fairly long-in-the-tooth) Oregon Scientific weather station installation which has always frustrated me with its lack of connectivity. It does have a 9-pin, D-type serial connector on the bottom, but that assumes that you have an RS232 equipped machine within cable reach of the display unit (and that HID‡ would not object to yet another trailing cable). I had toyed with the idea of plugging an ESP8266 into that port, with the excellent serial adapter firmware from JeeLabs, but it doesn’t really address the HID/cable/ugliness issue. Both of these methods also suffer from a fatal design flaw with this particular model of weather station, in that data isn’t squirted out of the serial port unless all of the sensors which this model was sold with are operational (otherwise you just get an error message along the lines of “Rain sensor not detected” and nothing else). So I concluded that, by collecting the (433Mhz) transmitted data from the actual sensors (which are remote from the display unit), I could just use the data directly and ignore the base-station/display part of my weather station completely. Hence my interest in the 433Mhz gateway project. The final piece of the puzzle to drop into place for one of those light-bulb moments came when I was reading through the comments to one of Pete Scargill’s recent articles on the 433Mz RFLink project. Commenter Paul gave a link to a GitHub repository called “rtl_433”, which is a 433Mhz decoder for SDR dongles by Benjamin Larsson. Benjamin’s project is specifically for picking up the data from remote sensors (from many, many manufacturers) which operate in that open, 433Mhz band. I’d recently bought an SDR dongle from a vendor on Ebay which was advertised as having an R820T tuner chip, suitable for ADS-B monitoring. It turned out to be a bogus ad, with the actual tuner chip being a 0012, which doesn’t even cover the 1090Mhz ADS-B band. I threw the useless dongle into the drawer and ordered a decent one directly from the manufacturer (which, incidentally, has worked perfectly from the first moment it was plugged in – Nooelec.com is the place to go), writing off the $10 Ebay one to experience. Having seen Paul’s post, retrieved and compiled Benjamin’s “rtl_433” package and pulled out the “useless” dongle from the murky depths of the spares drawer, I had direct data from all of the Oregon Scientific sensors published to MQTT in less than five minutes after plugging it in. One cat neatly skinned in a completely different way to that which I’d originally envisaged. The “-F json” argument to rtl_433 is to force the data to be output in JSON format. It will also accept “csv” (comma separated values) and “kv” (key:value pair) format arguments. Note that the “direction” readings are meant to be in degrees, so 902.000 (last line) doesn’t make much sense. Looking at the code and at the actual weather station display, it seems like there’s a nibble ordering issue with the decoding of the raw data and that should actually read “290”, instead (the fix is tested here and is now working its way backup the line). It’s nice to see a project that develops over time and Florian has a good example on his blog. He started off in the middle of last year by putting together a low-cost, arduino-based sensor for his garden and things seem to have just grown from there :-). You can follow along on his blog from the initial version of his bidirectional 433MHz, ESP8266-based, MQTT gateway, progressing to the IR enabled version by the end of the year and his OpenMQTTGateway project this year. It’s a good read and a great little project to follow.